What a tantalizing aroma…onions, garlic, chives, and leeks sizzling in a pan. This combination of kitchen herbs is the basis of many culinary masterpieces. While these traditional seasonings delight our taste buds, they can make our other “buds” (i.e., our dogs) very sick. Here’s what dog owners and amateur chefs should know about this fearsome foursome. All four species of herbs belong to the Allium family and have been kitchen staples for ages. Quite a large family, there are approximately 95 species of cultivated or native leeks, chives, garlic, onions, shallots, and scallions in North America, not counting ornamental varieties. The plants form bulbs that nestle underground and are very aromatic. Green above-ground shoots are edible as well but emit a less intense odor. "...garlic being the most toxic." The domesticated species commonly implicated in canine toxicity are Allium cepa (onion), Allium porrum (leek), Allium sativum (garlic), and Allium schoenoprasum (chive), with garlic being the most toxic. Consumption of the fearsome foursome causes gastroenteritis or inflammation of the GI tract beginning with irritation of the mouth and nausea, both of which cause dogs to drool excessively. These poisonous plants also cause abdominal pain, vomiting, and diarrhea. The GI disturbance is uncomfortable and downright miserable, but is usually not fatal. These simple veggies have a complicated mechanism of action. They cause oxidative hemolysis of the red blood cells as the concentration of oxidants in the red blood cells exceeds the ability of antioxidant metabolic pathways to “de-toxify” the cell. The red blood cell membranes become fragile due to direct oxidative damage and burst. Red blood cells are needed to carry oxygen throughout the body so when these cells are destroyed, there is impaired oxygen delivery to important organs. Decreased numbers of red blood cells result in anemia, weakness, and lethargy. Alliums also relax heart muscles and dilate blood vessels causing circulatory problems and low blood pressure. This leads to weakness and further impedes the delivery of oxygen to vital organs. Moreover, chemicals derived from some of these plants diminish the ability of the blood to clot. This foursome is truly fearsome! "It doesn’t take much to make your dog sick." And they are potent! It doesn’t take much to make your dog sick. 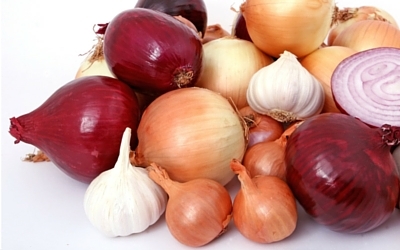 Dogs can become ill if they eat as little as 0.5% of their body weight in onions at one time. That means one good sized onion can make a 50 lb. dog ill. Dogs can get sick if they eat a large quantity of the plants at a single sitting or if they nibble on small amounts repeatedly. What are the signs of illness? If your dog eats a small amount of garlic or onions or leeks or chives, he may lose a few red blood cells but may not become sick. If he scarfs down a moderate amount, he may feel a little weak or lethargic, but you may not notice anything wrong. But if he is a glutton and eats a bunch a once or nibbles a little every day, over time he will show some of the following symptoms: foul breath, irritation of the mouth resulting in hyper-salivation or drooling, nausea, abdominal discomfort, vomiting, diarrhea, reddish discoloration of urine, lethargy, weakness, ataxia (wobbly gait), elevated heart rate, increased respiratory rate or panting, pale gums, exercise intolerance, or collapse. Your observations will help diagnose your dog’s illness. If you see your dog eat one of these toxic plants in any form whatsoever, call your veterinarian. Your dog’s doctor will depend on a combination of history, physical findings and laboratory tests to diagnose the condition. In addition, the appearance of microscopic Heinz bodies, which are changes on the surface of red blood cell membranes, will help confirm the diagnosis. If the ingestion was recent, your veterinarian may induce vomiting to remove undigested herbs from your dog’s GI tract; however, you should not induce vomiting at home without consulting your dog’s doctor. Your veterinarian may also administer activated charcoal to decontaminate the GI tract. These tactics serve to prevent the toxin from taking hold in the body. If the toxin has already begun its dirty work, your dog may require supportive care in the form of IV fluids and medications to alleviate GI symptoms. If the anemia is severe, he may require a blood transfusion and oxygen therapy to protect organ function. Hospitalization and lengthy monitoring may be required because the worst stage of anemia usually occurs several days after consumption. As with all poisons, early intervention is important. Call your veterinarian right away if you suspect your dog has eaten any of these plants. It’s important to note that any form of these vegetables can be toxic. Dried, powdered, liquid, cooked or raw herbs are all poisonous to your dog. Another dangerous source of these toxic plants is human nutritional supplements. 1. Fence off gardens containing onions, garlic, chives or leeks. 2. Securely dispose of unused portions when cooking. 3. Do not give food seasoned with these plants to your dog. 4. Keep spices and nutritional supplements out of reach of your dog. With a few precautions, your delicious meal spiced with onions, garlic, chives or leeks will not be interrupted by a sick dog!